The MEA (Manchester Teacher’s Union) has sent down and edict to all of its members to fight parents on the refusal of the Smarter Balance test. This is not a reflection on ALL teachers. As we know some Manchester teachers have come forward to fight on behalf of our kids. Across the nation several have refused to administer the Smarter Balance test to their students at the risk of their own livelihoods. However, it seems that the MEA only comes out when money is on the line as it pertains to teacher salaries. Education is supposed to be about the children. We have a lot of work to do in order to win this battle and fix this broken system. We begin with sending a loud message regarding the Smarter Balance test on February 9th at City Hall at 7:00pm. Please join us. This entry was posted in Opting Out, Testing and tagged Manchester, MEA, Teachers, union on February 7, 2015 by Admin. It’s true, that “Parent REFUSALS” are NOT approved by the State, nor do they have to be. But, PARENT REFUSALS of the Statewide Smarter Balanced Assessment will be listed as “did not participate for OTHER reasons”, which is a reason not included as 1 of the 5 approved special considerations – on the Statewide Assessment Results. Interesting that the NH DOE only included the parent refusal participation criteria policy on the same page as the NH Alternate Assessments Special Considerations page, which at first glance, makes it look like the Parental REFUSAL policy for the Statewide Assessment is somehow only for students with Special Considerations – “needs” in Items 1 though 5. But, the Parent Refusal policy is actually found in the title as Participation Criteria on this page that I have provided for you and where the actual link is located to get you to the second page where you will find the paragraph about PARENT REFUSALS, etc. If parent refusals were only for disabled or qualifying Special Consideration students, it would be discriminatory to totally exclude students who don’t have special needs and to not be included in the “Parent Refusals” participation criteria. MAKES NO SENSE! How silly would that be. Please know, that a parents’ fundamental right to REFUSE the Statewide Assessment can be exercised in NH whether the student has special needs to be considered or not. The NH DOE just doesn’t want all of the parents of NH to know that. Just another reason to REFUSE. 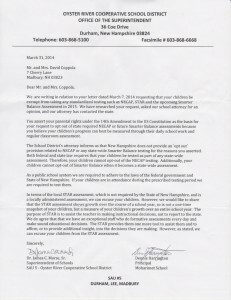 Why is the NH Department Of Education and District School Superintendents trying to deceive the parents into believing that it’s against the law to refuse the Government Assessment? NO State Statute (RSA) can supersede a parents Fundamental Right to direct the education of their child. If a parent wants to REFUSE the STATEWIDE Government Assessment (SMARTER BALANCE) of their child, they should just choose any Smarter Balanced Assessment REFUSAL Notification Form, SIGN IT, and SUBMIT it to the child’s school principal. Parents (you) should also make a point to go back after submitting the form to the school principal and check with the child’s teacher and the principal before testing begins in March 2015, if they have any intentions to Assess (test) your child, anyway, after you have submitting the form to them. Maybe they just need to be reminded to pay strict attention to your Legal Statement exercising your right to REFUSE this assessment for your child, and your signature – indicating the “REFUSAL”. To avoid any mistakes from happening by teachers perhaps assessing anyway, the child should be taken to the library or another room to read a book, write, or do homework, with proper supervision while testing is going on in the classroom. NH is a COMPULSORY ATTENDANCE State and it is illegal for any teacher or School Administrator to advise or force a parent to keep your child home anytime during the several weeks of the Assessment period because of your “REFUSAL” to have your child assessed – whether they be half or whole days doesn’t matter. Parents should not be inconvenienced with time-off from work. ED. Comm. Virginia Barry should not have promised the Federal Government 95% participation rate for the people of NH. Saw-rryy Virginia : ) I hope you won’t meet your quota for the Feds. And, “We The People” of NH won’t put up with NH School Superintendents and Assistants (cronies) who intimidate and bully parents and our elected School Board members either. Also, Virginia, please find another job. Your rudeness to the people of NH and deceptive practices are not appreciated. NH Citizens, please forward this email to folks in your email address book who you know would appreciate receiving this important email news. This entry was posted in Opting Out, Smarter Balance, Testing on February 1, 2015 by Admin. Use this form to opt out of the Smarter Balanced Assessment used in conjunction with Common Core. This entry was posted in Opting Out, Smarter Balance, Testing on January 20, 2015 by Admin. Hopefully the following information will help parents put to rest their fundamental rights to guide and direct the education of their children. We know parents have been receiving conflicting information from their school administrators on whether or not they have the right to REFUSE the Common Core Assessments for their children. WE CONTINUE TO ENCOURAGE PARENTS TO REFUSE THE STANDARDIZED ASSESSMENTS and hope this information will help you in that decision. 2) Will your child’s “placement” in a class be impacted? 3) Will your child be held back from advancing to the next grade? In other words will your school district TRY to PUNISH you and your child? IF so, please let us know immediately. This entry was posted in Opting Out, Testing on January 13, 2015 by Admin. The NH DOE and BOE have turned a deaf ear to concerns that have been raised by many people. Only now has Commissioner Barry “offered” schools the option of using the SAT (which will also be a Common Core assessment) as a replacement IF all schools AGREE to use it. Where is the local control? What about Wakefield whose School Board was wise enough to reject the Common Core Standards and instead, use the better quality (OLD) Mass. Standards? Why should they subject their students to ridiculous and confusing math questions that do nothing to show a child’s true math proficiency? The NH Dept. of Ed and Board of Ed. simply follow the Federal Department of Education that continues to use our kids like guinea pigs in this continued failed experiment. WE URGE PARENTS TO REFUSE THE STANDARDIZED TESTS. At the MINIMUM all parents should observe the classroom when these tests are given to their children. Make notes and send us an update. Thanks to the Union Leader for their coverage and more importantly, to teachers like Oden who are courageous enough to speak out. NASHUA — Some results from the latest round of i-Ready assessment tests may have been flawed because the test company, Massachusetts-based Curriculum Associates, failed to tell the school district that tables used to interpret scores had been changed. Students in first through ninth-grades take i-Ready math and reading assessment tests three times each year. Teachers use the results of the 45-minute tests to understand each child’s academic strengths and needs, and to tailor instruction to each individual child. “We were not updated on one of the test tools, the placement tables,” said Superintendent Mark Conrad, who added that Curriculum Associates recalibrated those tables without telling the school district. Conrad said the result was that children from two or three elementary schools were placed in the wrong “skills groups.” The error has since been corrected, and Conrad said the district may receive a financial credit from the company. Although Conrad said the school district has been working with Curriculum Associates for about three years, and the experience has been “exceptional,” the glitch put assessment tests back in the spotlight at the Board of Education meeting this week. BOE member Dotty Oden, a former first-grade teacher at Amherst Elementary School, said she has had ongoing concerns about i-Ready tests and the upcoming Smarter Balanced tests that begin this spring. Like Smarter Balanced, i-Ready is an online, adaptive test program based on the Common Core standards. “I have been hearing from teachers that the data from the tests is not indicative of the children they are seeing in the classroom,” said Oden who added that some teachers saw their entire class score below grade level on i-Ready tests. While Common Core advocates say the new standards and tests are more rigorous and better prepare students for college and careers, Oden and others worry that the tests are developmentally inappropriate, particularly for math. “Kids at early stages of development are more concrete thinkers,” she said. The new standards and tests require critical and abstract thinking which Oden and others say is out of sync with how children naturally develop. And because i-Ready tests are used to inform teachers on how to teach, and are not part of grades, Oden worries that students in higher grades don’t take them seriously. Still, Conrad said i-Ready gives teachers information they can use to decide the next best instructional step for students. “In many cases, teachers say they do get valuable information from i-Ready,” he said adding that the test results are part of a mix of other measures such as classroom work and regular test scores. But for Oden, those more traditional measures and a teacher’s observations and experience offer a broader and more reliable assessment of students. This entry was posted in Opting Out, Testing and tagged Conrad, Nashua, Ogden, UnionLeader on December 19, 2014 by Admin. Here is an article about the PARCC in NJ and how parents are just starting to wake up about the nightmare that is Common Core aligned standardized testing. The last paragraph states that the districts are required to have 95% of the student population take the test and the uncertainty of what the ramifications are if they do not meet that number. We know that here in NH Commissioner Barry is trying to strong arm parents via the district administrations into thinking that refusing the test is not an option. We suggest sending a REFUSAL letter to your child’s school principal this week refusing the SBAT. If you choose to NOT opt out, we HIGHLY encourage you to sit in on the classes as your children go through the testing. We are hearing from teachers that the process is taking a real toll on SOME of the children and if your child happens to be one of those kids, you will at least have an option to step in at that point. This entry was posted in Opting Out, PARCC, Smarter Balance, Testing on December 16, 2014 by Admin. PARENTS ARE ENCOURAGE TO “REFUSE” THE SMARTER BALANCED ASSESSMENT!! March 16, 2015. The window is 12 calendar weeks and will end on Friday, June 5, 2015. This entry was posted in Data Mining, Opting Out, Smarter Balance, Testing on November 9, 2014 by Admin. 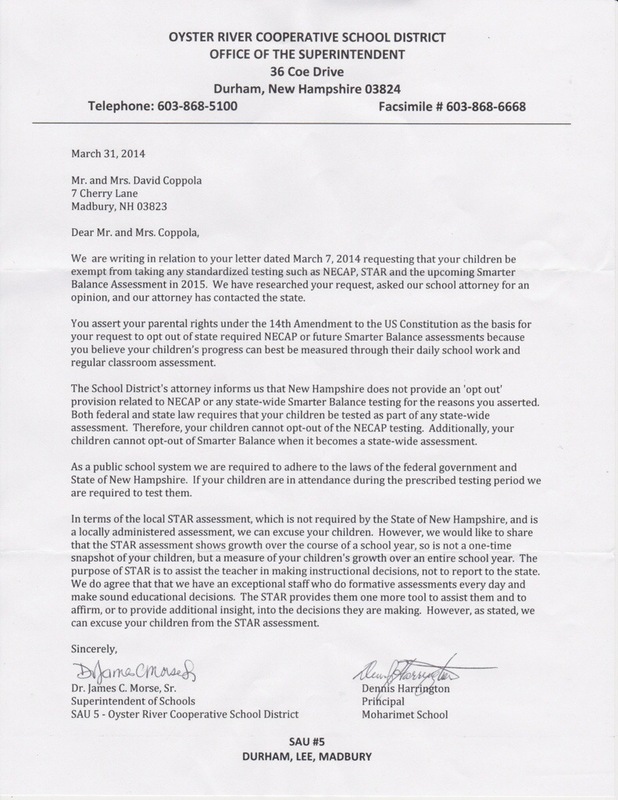 Is your Superintendent denying YOU your parental rights on opting out of the Common Core tests? Some parents are contacting us with stories of Administrators pushing back against them as they seek to remove their children from the harmful impact of over-testing. We’d like to post some resources for parents to look at and use if they are put in this position. We have TEACHERS and CHILD PSYCHOLOGISTS telling us that these standards and over-testing are CHILD ABUSE. FIRST GO to your School Board and ask them if they will PAY for your child’s psychological needs if the school inflicts harmful practices on your children. SECOND let your School Board know that the Superintendent is bullying you into what you see as abusive practices on your children. THIRD engage the media and let them know that they are trying to deny you YOUR parental RIGHTS. This entry was posted in Opting Out, Smarter Balance, Testing on September 3, 2014 by Admin.